The Chief Constable for Lincolnshire today vowed to launch a new drive to tackle rural crime. Chief Constable Bill Skelly told delegates at a meeting in Boston that he would be drawing up an action plan to tackle the issues being faced by rural communities. He also pledged to put more resources into addressing the problems immediately. His stance is supported by Lincolnshire’s Police and Crime Commissioner Marc Jones who told the audience that working in partnership was crucial to success. At the meeting, organised by the Nation Farmers Union (NFU), farmers told a panel of MPs, the Chief Constable, the PCC and his deputy of their experiences in tackling hare coursers. They said that although hare coursing had existed for generations, the current gangs are more organised and more threatening. Social media and drones are also being used regularly to organize and film meetings, as thousands of pounds change hands with the gangs betting on the outcome of the coursing. 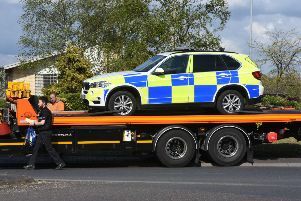 Chief Constable for Lincolnshire Police, Bill Skelly, said: “I sympathise with members of the farming community, understand their frustration and accept this is damaging their livelihood. It isn’t acceptable and I am taking this matter very seriously. “We have already committed more officers to tackling this, we will look at the way we gather information and use it, consider how we collaborate with other forces and also explore new technologies. Police and Crime Commissioner for Lincolnshire, Marc Jones said: “I was clear that rural crime will be successfully tackled when working in partnership with other agencies and groups. “It became very clear to me early on that the best way to tackle hare coursing is to confiscate the dogs, but we need the support of the whole justice system for that to work. “We are getting support from our MPs in ensuring we have the right laws and the appropriate funding to address rural crime and we need the justice system to make sure offenders are dealt with strongly. NFU Regional Director for East Midlands, Gordon Corner, said: “This was a very productive meeting. It is the first time that a Chief Constable has addressed NFU members on rural crime and in particular the issue of hare coursing. “There were more than 100 NFU members present who explained the issues they face, the destruction to family businesses and the fear and intimidation their families and staff experience. Mr Skelly heard that this year the number of experiences of hare coursing has increased, as has the numbers of people and vehicles involved.